October is full of fun holidays to celebrate! We all know about Halloween and Thanksgiving (for fellow Canadians who celebrate in October) but what about fun & bizarre October holidays like National Grouch Day and International Newspaper Carrier Day? Here are some fun & bizarre October holidays holidays worth celebrating! October 1st – World Vegetarian Day: This is a great time to try that vegetarian dish you spotted on Pinterest! October 4th – Ten-Four Day: Grab those walkie talkies and enjoy some fun family play time! You could play a game of hide & seek with walkie talkies, try to solve a mystery with secret messages over walkie talkies…and the list goes on! Just don’t forget to use proper radio phrases like “10-4”, “Roger That” & “Do you copy?”. October 5th – World Smile Day (always the first Friday in October): Celebrate this cheerful day by having your kids brainstorm things that make them smile. Write the ideas on a large poster board and see what fun family activity ideas you can plan from these! October 13th – International Newspaper Carrier Day: It’s a great day to leave a big THANK YOU note on your front porch for your newspaper carrier! October 15th – National Grouch Day: According to Sesame Street, today is a day to celebrate being a grouch. Perhaps you could make some grouchy looking cupcakes or write a fan letter to the Grouch himself! October 16th – Dictionary Day: I’m sure most kids don’t think of the dictionary when they are looking for something fun to do…but that may change when you give them this free printable dictionary scavenger hunt game! I bet you didn’t think you’d be able to sneak in a little learning with these bizarre October holidays, did you? October 17th – National Fossil Day: Is there a museum in your city? Today would be a great day to go explore some fossils at your local museum. You could even bury some plastic dinosaurs in your backyard for the kids to discover. Here are some fun dino dig activity ideas to help you get started. October 26th – Frankenstein Friday (always the last Friday in October): Frankenstein Friday is an excellent way to kick-start your Halloween celebrations. Perhaps you could make some green pancakes for breakfast and start planning a spooky Frankenstein inspired haunted house. This is a great way to get started on Halloween decorating and carry these bizarre October holidays right through to the end of the month! October 27th – Make a Difference Day (always the 4th Saturday in October): Have your children think of nice things they could do to help other people or animals. Have your children choose 1 or 2 things off the list to do today to make a difference in someone’s life. Hang onto this list they’ve created and regularly refer back to it to complete more acts of kindness! 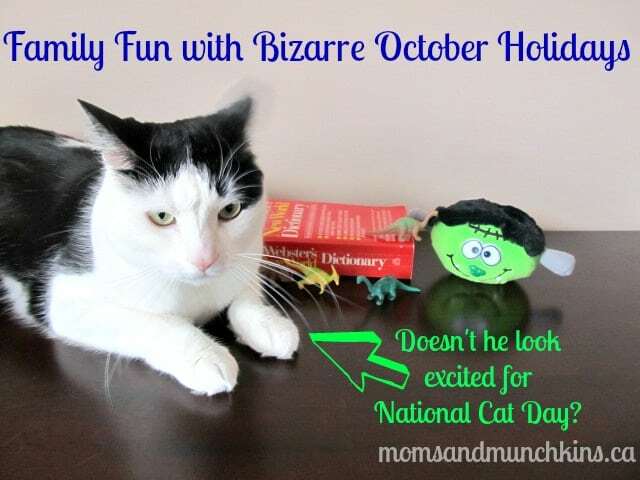 October 29th – National Cat Day: Do you have a pet cat at home? If so, today’s the day to spoil her with kindness! Your kids can prepare a special tuna treat for her or make homemade cat toys. October 31st – National Caramel Apple Day: I LOVE caramel apples! With a little searching on Pinterest, you’ll find plenty of delicious caramel apple recipes to try (and I’d love to hear about your favorites!). Do you know of any other bizarre October holidays? Which of these bizarre October holidays will you be celebrating? Stay updated on the latest & silliest ideas for family fun by following us on Facebook, Twitter, Pinterest and Bloglovin’. *Visit Brownielocks & The 3 Bears for a full list of October National Holidays that you can celebrate. She has the most complete list of holidays that I’ve seen. I had no idea october 1 st was world veggie day!! We are vegetarians! some very interesting holidays coming up! Who knew there was a national grouch day! Ewww…don’t know that I’ll be celebrating that one! I love your list and plan to refer to it all month long. I’m a vegetarian I can’t believe I missed World Veg Day! I’ll deff be indulging on Caramel apple day!